Reproduction of a classic EL-34 XF2 Pair Getter tube. The GT-EL34M was shown at NAMM. This tube is based upon a tube which is considered something of an icon to EL34 users in both the audio world and guitar amp world. 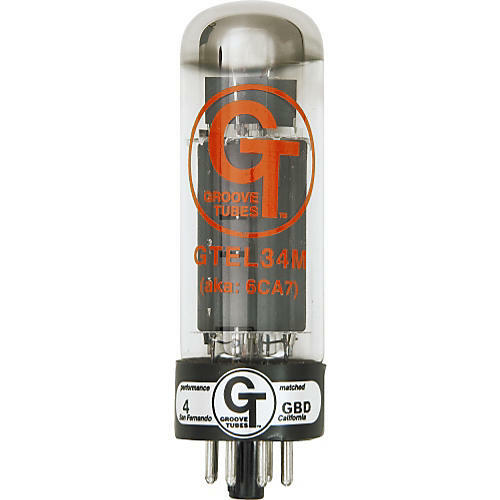 There were a number of variants of the original tube and GT chose the classic XF2 dual getter version to reproduce. This tube is now available in matched quads and duets. Low-rated tubes have early break-up and distortion, wide range and softer attack good for rock and blues solos. Medium-rated tubes offer normal performance, great dynamic range/attack and are the best all around rating type for all styles of playing. High-rated tubes have the most dynamic range and the most clean power/less break-up for power players, jazz guitarists and bass amps.